Nature photographers often claim that birds are the hardest things to photograph... especially songbirds. They're small, they move fast and they generally shy away from people. There's no doubt about it, getting a good shot of a songbird is something to be proud of! 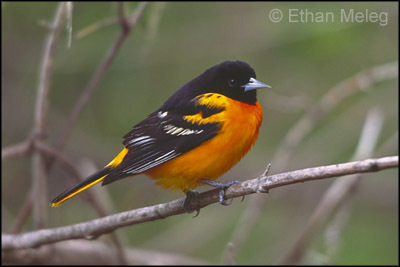 One well-known bird photographer says it aptly - he refers to his best songbird photos as 'the family jewels'. So how is it that every time you open a birding or nature magazine, there are pages of stunning shots of songbirds? Is there something the pros know, that the rest of the world doesn't? What's the secret? Feeder set-ups are one of the best examples of a 'planned approach' to photographing songbirds. You might be surprised to know that many of the great songbird photos you see in magazines and books were taken at or near feeders. Feeders attract birds within the range of your telephoto lens, and cause the birds to land in somewhat predictable spots. To put it simply, feeder set-ups make bird photography way easier! 1) Find places where birds are already accustomed to people and/or being fed, such as city parks or backyards. 2) Learn what types of food are preferred by the bird species you want to photograph. Bird feeding stores are excellent places to get this information. 3) Sudden movements scare birds away. Move extremely slowly, or better yet, shoot from a blind or an open window. 4) Study the light for several days before putting out your feeders and perches. Make sure they're in a spot that gets morning or afternoon light, depending on when you'll be shooting. 5) Try to position your perch in a spot that will result in a clean background for your photos. 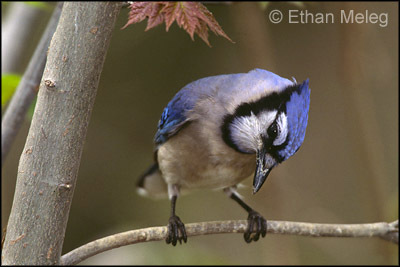 6) Your own backyard is often the best place to attract birds to feeder set-ups! I photographed this Blue Jay from an open window in my parents' house. There are feeders all around the bird, and it always stopped on that branch before feeding on the ground beneath the nearest feeder. My parents put oranges in the tree next to their deck to attract orioles during spring migration. I shot this bird from the comfort of a lawn chair on their deck (how could life get any better?). There's an orange just to the right of the bird, and he faithfully landed at this spot before jumping to the orange. 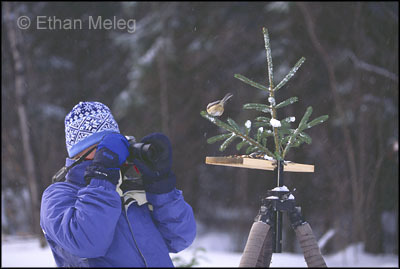 This is my all-time favourite bird photography setup, which has produced many of my best songbird photos. It's very simple: mount a small platform to an extra tripod, stick a perch on it and offer a bit of food on the platform. You can easily move the whole rig to make sure it's in good light, and to position it for clean backgrounds. I have a wide selection of perches to add variety and uniqueness to the images.